If you are new to home theater all of the jargon and different technologies can be a little overwhelming at the outset. But have no fear, that’s where we here at Aperion Audio come in, we’ll help you sort out everything you need to know and even dispel a few myths along the way. This article will guide you through the cast of characters in a home theater setup as well as covering their functions. It’s size and shape allow it to go on or near your TV monitor. It usually isn’t designed to reproduce really low bass. Many speaker engineers think they work better if they can’t reproduce bass, since low frequencies are so affected by the surfaces around the speaker. In the case of Aperion center channels, we specifically design them for dialogue clarity by increasing the output of frequencies the human voice produces, in the midrange. Another engineering tactic we use for our Intimus 5C and Verus Grand Center is what is called a vertical array configuration. Which is a fancy way of saying that the tweeter is directly above the midrange driver. Keeping the tweeter and midrange in a vertical arrangement while the bass drivers are to the sides ensures that the speaker still performs well in a variety of sitting positions and that even when people aren’t right in front of the speaker (also called, “off axis”) they will still hear sound that is accurate. The front speakers are the hold overs from your classic two speaker setup from back in the day. They’ll usually be located to the left and right of your TV. These speakers lead double lives. In their home theater life they handle most of the soundtrack and off-screen effects. In their stereo life they transform into the main speakers when you’re listening to CDs. Fortunately, conventional full range stereo speakers or bookshelf speakers with a subwoofer work for both of these applications. A greater effort has been made to get the high frequency drivers near ear level. They are matched to the drivers in the rest of the home theater speakers. These days front channels tend to be smaller than they were back before the rise of home theater. One reason is aesthetics, they can blend in with your decor easier, but technological advances like digital sound processing (DSP) in A/V receivers has allowed smaller speakers to sound bigger. Another engineering trick is to make speakers less sensitive, that is require more power to create the same sound in decibels, which can then increase the amount of bass you get from a smaller speaker. As long as you use an amplifier with adequate power, you’ll still be able to crank the speakers up as loud as you want. 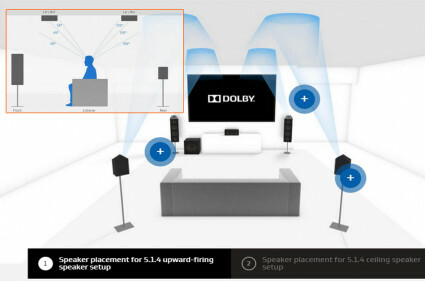 1.Dolby Labs recommend using a bookshelf speaker (could be the same as your fronts and center) positioned so they are a little higher than ear level. A dipole speaker is one that has two sets of drivers that fire in opposite directions. These two sets of drivers fire out of phase with one another. That is, when one is pushing out, the other is retreating back into the cabinet. Consider this, if you wire two identical speakers out of phase with each other and you are equal distance from them, you won’t hear either of them without the room reflections. While one speaker is pressurizing the air, the other is rarefying. The result is that the waves cancel each other out. Now, if you place these speakers back-to-back and put them on a wall at equal distance from you, you’ll hear reflected sound. This makes the sound very diffused and hard to localize. The idea is, instead of just hearing sound firing at you from the specific location of a speaker, you’ll hear it throughout the entire room, creating a more realistic and enveloping experience. There’s another type of surround speaker called bipole, which is a speaker with two sets of drivers that fire in phase with one another. This type of speaker is an intermediate between a traditional front firing speaker and a dipole. It doesn’t give you quite as diffuse of a sound as a dipole speaker, but it does have a much broader soundfield than a regular speaker. Our Verus Surrounds have a switch so you can go back and forth between dipole and bipole modes depending on which is best for you speaker placement and usage. By contrast, our Intimus 4BP speakers, are strictly bipole. 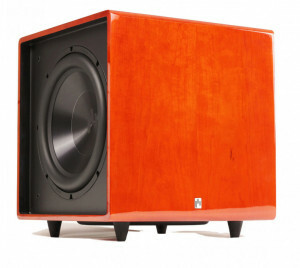 The subwoofer is a speaker that is dedicated to doing one thing and one thing only, producing deep, powerful bass. Without a subwoofer, or “sub”, you won’t get the visceral “punch you in the gut” feeling that a home theater equipped with powerful bass can deliver. Because of this, a sub goes a long way to putting you inside the action of a movie and making it seem like that much more of a real experience. The sub is the .1 in a 5.1 or better setup. Some folks even use two subs for a “.2″ setup in order to make sure the entire room is filled with bass. You can read more about setting up your sub and placement here. The latest development in home theater technology on the audio side are the new surround formats such as Dolby Atmos and DTS: X that utilize height channels, that is speakers that project sound above the listener. This is done either by in-ceiling speakers or speakers specifically designed as height channels with upward firing drivers. The result when all the speakers work together is a more 3D soundfield with sounds moving all around the room rather than just from side to side and front to back. It allows for sounds to pan upwards and to give the impression of sounds moving over the head of the listener. Height channels are added in pairs and most receivers that support Atmos or DTS: X will allow up to four height channels. If you have an 11 channel receiver, you could power a 7.1.4 system, which is a 7.1 configuration with four additional height channels. In terms of placement, typically the first row of height channels would be in front of the sitting position by 1-2 feet and the second row behind by 1-2 feet. You don’t see these speakers in many home theater setups, but they are an additional pair of speakers placed wider than the front channels and usually spaced slightly closer to the listening position. They give a broader soundstage and some receiver processing modes like Dolby Atmos or Audyssey DSX can create unique channel content for these speakers, just like height channels. There’s no question that height channels are becoming more popular in the home theater world, but front wide channels will probably remain a feature that never really catches on with anyone but the most dedicated home theater enthusiasts. That wraps up our look at all of the possible speakers that make up home theater set up. If you are just getting into this hobby hopefully this helped kick things off and showed you all of the options you can consider. Thanks for reading and happy listening!